This item has been sold, but you can enter your email address to be notified if another example becomes available, or purchase a digital scan. An exemplar of mid-19th century French decorative map making. Nouvelle Carte Universelle Du Monde. 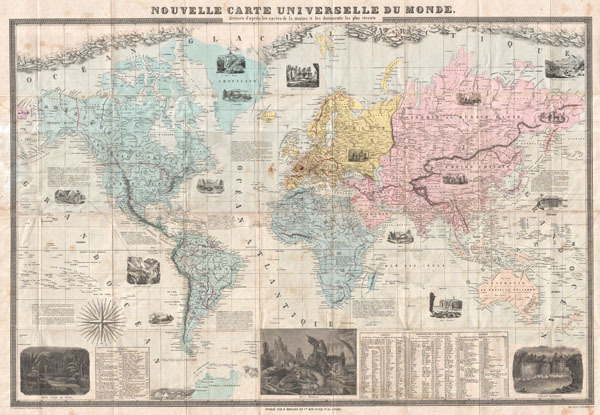 A fine example of Felix Delamarche's 1859 case map of the World. Drawn on a monumental scale, this incredible map covers the known world, from the Arctic Icecap to the just discovered Terres Australes (Antarctica). The map purports to be based upon nautical charts and the most recent marine documents available. Cartographically it reflects some of the most recent discoveries, particularly in the Arctic and Antarctic - for which the 19th century world had a particular fascination. In addition to the standard cartographic elements, Delamarche has added a host of additional information including cultural notes on the peoples and places depicted and no less than seventeen illustrative vignettes. Some of these include prospectors panning gold in California, a large illustration of arctic explorers besieged by angry polar bears, the Great Wall of China, the Falls of Niagara, a Micronesian House, and the Amazon Rain Forest, among others. Tabular data at the base of the map showcases the distances of the worlds capitals form Paris, the lengths of the world's great rivers, the heights of mountains, and a timetable of discovery. Engraved by Felix Delamarche of 45 Rue St. Andre des Arts, Paris for B. Renault and Company, 46 Rue D'Ulm, Pairs. As a whole this map is an exemplar of a mapping style developed in France during the mid 19th century. Though not properly recognized, this style is marked by a number of cartographic conventions. European, particularly French, map publishers of the period started to take advantage of the sophisticated lithographic techniques being developed at the time. Able to economically print highly detailed maps on a massive scale, French cartographers began illustrating their maps with numerous decorative views and other engravings. Though the inclusion of pictorial elements in maps was nothing new, the style is distinguished from earlier cartographic graphics by its intent. In the 18th century graphic elements tended to be either purely decorative or allegorical. By the early 19th century, through the influence of the comparatively minimalist English cartographic traditions of Cary, Pinkerton and Thomson, graphic illustrations had all but vanished from maps. With the birth of the arm chair explorer in the mid-19th century, illustrative images once again began working their way into maps. These new illustrations however, were pictorial and intended to illustrate natural wonders, foreign cultures, and exotic animals. Examples of this style include the Illustrated Atlas of Englishman John Tallis and, more commonly, the cartography of the French tradition exemplified by Levassuer, Vuillemin, Delamarche. Charles Francois Delamarche (1740-1817) founded the important and prolific Paris based Maison Delamarche map publishing firm in the late 18th century. A lawyer by trade Delamarche entered the map business with the acquisition from Jean-Baptiste Fortin of Robert de Vaugondy's map plates and copyrights. Delamarche appears to have been of dubious moral character. In 1795 the widow of Didier Robert de Vaugondy Marie Louise Rosalie Dangy, petitioned a public committee for 1500 livres, which should have been awarded to her deceased husband. However, Delamarche, proclaiming himself Vaugondy's heir, filed a simultaneous petition and walked away with the funds most of which he was instructed to distribute to Vaugondy's widow and children. Just a few months later, however, Delamarche proclaimed Marie Dangy deceased and it is highly unlikely that any these funds found their way to Vaugondy's impoverished daughters. Nonetheless, where Vaugondy could not make ends meet as a geographer, Delamarche prospered as a map publisher, acquiring most of the work of earlier generation cartographers Lattre, Bonne, Desnos, and Janvier, thus expanding significantly upon the Vaugondy stock. Charles Delamarche eventually passed control of the firm to his son Felix Delamarche (18th C. - 1st half 19th C.) and geographer Charles Dien (1809-1870). It was later passed on to Alexandre Delamarche, who revised and reissued several Delamarche publications in the mid-19th century. The firm continued to publish maps and globes until the middle part of the 19th century. Very good. Original fold lines exhibit minor toning and verso reinforcement. Minor marginal damage and staining where the map was originally attached to boards. Marbled cardboard boards included.